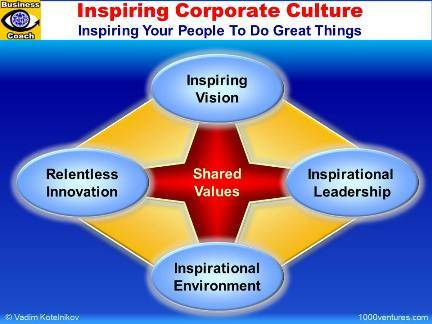 An inspired culture is the greatest asset in business. Inspirational leaders create 'can-do' attitude and make business fun. They unlock inner power of their people and sustain their commitment. They inspire, energize and move people. They build corporate communities in which people feel valued, capable, confident and strong. They inspire team members to believe in the extraordinary work they can do together. Making mistakes is essential to innovation and organizational growth, as long as systems are developed to avoid making the same mistake twice. Diversity of thought, perception, background and experience enhance the creativity and innovation. Develop a fast-paced flexible culture. Mobilize your people around a common goal. Help them feel a part of something genuine and important. Apple is an incredibly collaborative company. You know how many committees we have at Apple? Zero. We're structured like a start-up. Break rules and "fail forward" so that change is part of the culture, and little setback is experienced.